Throughout this winter, cold surges associated with winter monsoon occurred less frequently. That is why the winter mean temperatures were above normal in all parts of Japan. 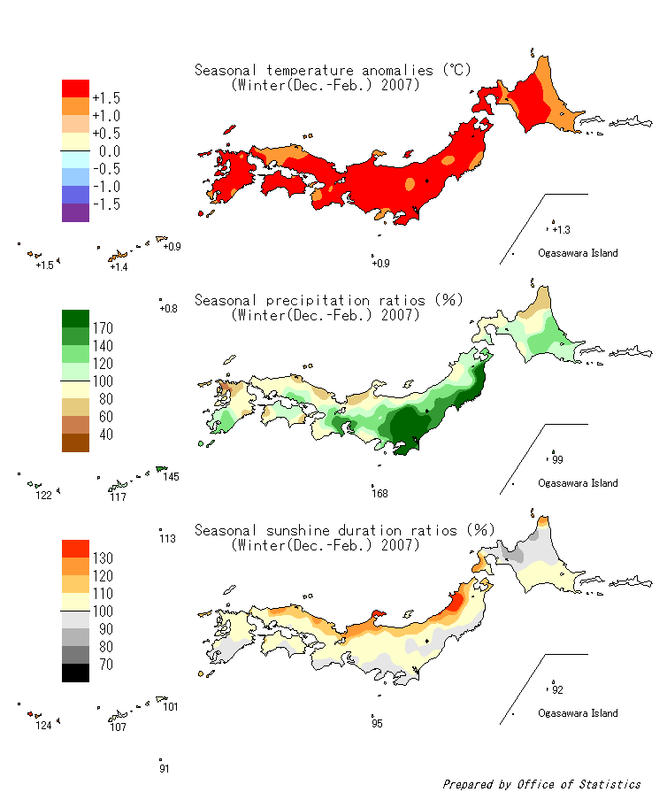 At 63 observatories, such as Akita, Sendai, Tokyo, Nagoya, Osaka, Takamatsu and Fukuoka, the highest winter mean temperature records were broken. The regional mean temperatures in Western and Eastern Japan were the highest since 1946/1947 winter, when the historical record began. (Figure 1, Figure 2). The snowfall amounts during the winter were significantly less than normal in whole Japan. Winter total snowfall amount was only 9% as much as normal in Hokuriku district and regional mean winter snowfall amounts in the regions along the Sea of Japan were the least since 1961/62 winter, when the historical record began. In Hokuriku and San'in districts, the winter precipitation amounts were less than normal, too. In the late December and in the early January, rapidly developing lows passed northward along the Pacific coast of eastern and northern Japan and brought heavy rains and stormy winds. Due to the heavy rains, the winter precipitation amounts in the Pacific side of eastern and northern Japan were above normal. Base period for normal is 1971-2000. Numerical value in the left side shows winter mean temperature anomaly in each sub-region. (+)* indicates the temperature anomaly is significantly above noraml.